If you no longer want to use a site, you can remove it from your Managed WordPress account. Note: Removing a Managed WordPress Website with a domain on it will automatically park the domain until you use it again with another hosting product. Warning: Removing your site permanently deletes all content from your Managed WordPress website. You should only remove your website if you are okay rebuilding your website from the beginning. For the website you want to remove, click the three-dot icon in the right corner and then select Remove. Type reset, then click Remove to finish removing the site. 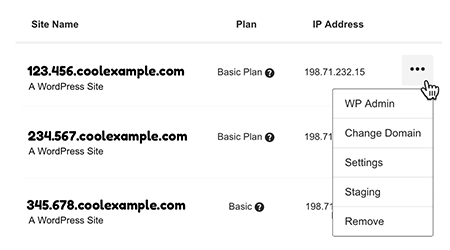 If you set up your account with that domain again, it will automatically update the domain DNS to point to your Managed WordPress hosting. How do I edit and delete products from my online store? My wordpress stuck on installing at 50% and there is no remove option. So how can i resolve it.